Another wonderful excerpt from Tales of a Magic Monastery, by Theophane the Monk. The Guestmaster looked at me carefully and lead me to a room marked Righteous Indignation. There wasn’t much in the room besides the four walls, and that was all right with me. I sat down and meditated a while. Then I read my Bible. I found myself looking at those walls. I read some more, then meditated, then looked at the walls again. Late in the evening, as I was staring at one of the walls, it became transparent, and I found myself looking at my own monastery. Fascinating. What’s more, as I watched, I found I could see right through its walls and into its church and cloisters. After a while I could even see inside the cell of each monk. I saw everything. I saw what each monk had in his room and what he was doing. I saw some praying, some sleeping, some reading. I could even see what each one was reading. Brother! Do you see what that one is reading? And look at the private property! Soon I could hear their voices. I could hear everything that was said—the complaints, the backbiting. My own name was mentioned. Huh—that one to be complaining of me! I began to take notes. I filled page after page. I thought the place was bad before, but here were the facts—what they said, what they did, what they had. Nothing subjective—just cold facts. As I kept writing, I began to see right into their heads, to see their very thoughts. These also I wrote down. Once, when I was resting my eyes, the thought came to me, “I wonder what I would see if the other wall were transparent?” Perhaps if I kept looking at it long enough… Well it did open up and through it I saw the Magic Monastery, every bit of it. What an eyeful! I thought my own place was bad. Talk about individualism. I began to write that down too. I rang for the Brother and asked him to bring me some more notebooks. There was so much to get down. From time to time a further question would come to me, “I wonder what’s behind these other two walls?” I became uncomfortable. “Who is there? What are the walls hiding? Why don’t they let me see? It’s probably dreadful.” I took to staring at these walls. The Brother said that behind the one wall were the deceased members of the Magic Monastery, and behind the other were the deceased members of my own monastery. “You won’t like it,” he said. But he refused and hurried away. I was determined that when he returned the next day I would get the truth out of him. I did. I took him by the throat and demanded to know what was going on behind those walls. “Behind this one,” he gasped, “are the deceased members of your own community. They are all looking in at you. They are weeping and praying for you. “Thank you, Pastor,” Jerry Michaels began, as he addressed the half dozen or so church leaders gathered around the small conference table drinking coffee during the Sunday School hour before Worship. “As you know, here at First Godly Church in the Community, we try to take a leadership role in presenting the Gospel and godly civic and family values for and to our town. “We did some ‘due diligence’ research, Mr. Josephson, regarding your membership here. You have shown remarkable Biblical knowledge, and have volunteered to teach Bible Study for the church. You’ve already impressed a number of our members and young people, and we wanted to consider you for a position of leadership in the church, beyond simple membership. “So, it was a bit of a disappointment, on all of our parts,” as Jerry looked sadly around the table, to the mournful nods of his committee colleagues, “when we looked into your activities in the community and found that you have a very questionable reputation. You’ve been seen to drink, and provide drinks for others. You keep very unsavory company. You are unmarried, but have been seen in the company of women of… well, let’s just say, very colorful reputation. “You must understand, its not just our concern about yourself, your own morality, or whether we trust you and your actions. It’s a matter of your witness, your identification with our church, and what the community will think of this church, and us as members. “I’m very sorry, Pastor… Mr. Josephson… but at this point it is the recommendation of our committee that you NOT be accepted as a candidate for membership, although you are welcome to continue to worship with us. You go to unacceptable places, consort with unacceptable people, and engage in unacceptable activities, such as drinking, dancing or partying, that give you a reputation for disreputable living and deeply compromise your witness both within this church and in the community. “At some future date, should you repent of your sins and these activities, we would be happy to reconsider your request for membership. But for the moment, I’m afraid that’s not possible. Is there anything you would like to add, Pastor?” Jerry asked. All eyes turned to the candidate, Joshua Josephson, as he smiled gently and nodded. Everyone waited for him to say a few words in response. Finally, he spoke. “Well, Pastor… Gentlemen… I’d like to thank you for your courtesy and consideration this morning, and your warm fellowship in this time. I think I’ll just be moving on now. Please don’t think I’m upset or angry at your words, I have been through meetings like this more times than I can count. I come to serve, and right now I am seeking a church home that will hear and receive Me just as I Am. Ministry is sort of a family business for Me, and this is just how we’ve done it for ages. “You’ve been very gracious, and I know you guard your reputation very diligently. At the moment, I have come to seek a church a bit less concerned for reputation, as concerned for grace and faith. I’ve nothing to repent, I’m afraid. But I shall move on down the road to seek a church. I’ve come back here, wondering if when I came I would find faith. “I am still seeking, but I always hope. I’ll look forward to seeing you around town from time to time. For now, I’ll just take My leave and move on. And, quietly wiping His feet at their door, gently He closed it behind Him as He left. I posted this fable almost two years ago now, on a different blog. I was amazed to see how long ago it was. My heart is in Church Set Free because I so want to be part of “Josh Finding a Church Home”! I’d love, one day, to see this story have a happy ending! When I was younger, this text mystified me a bit. I mean, on the surface its meaning is obvious… innocence… simplicity… yadda yadda. But when you know children, I mean really get to KNOW children… they can be a real pain. Hence, my confusion. I mean, frankly, while this seems like a lovely image… have you honestly ever met a “humble” child? Really? I haven’t. Children can be brutal. They clamor for status and primacy. Some of the cruelest people on the face of the earth I’ve ever known have been children. So… what is Jesus saying here, really? I’ve finally resolved that for myself, but if your ponderings lead you to a different place, that’s fine, too. Just thought I’d share this. Pretty big question. Pretty bold question. I suspect they were expecting a pretty big bold answer. What about you? If you had been standing there listening, or even if you had had the chance to ASK this question, what answer would you expect? Right? I would. Or perhaps they were thinking of all the history… the patriarchs, the prophets, the judges, the kings, King David. Perhaps they expected Him to name one of those. I bet they didn’t see THAT coming! Remember, they’d just shortly before been at the Transfiguration. Peter, James, and John had seen Jesus, Moses, and Elijah appear before their very eyes, and take counsel with Jesus. Peter wanted to make a shrine on that mountaintop. So I am more than certain that when they inquired about heaven’s greatest soul, they weren’t expecting some little kid in the street! So what was so special about kids? Or… what was so special about THIS little kid? What do kids have, that we don’t have? Why does Jesus use words like “converted” and “become like” as He points to this boy? How did this boy so dramatically “humble himself” that Jesus uses him as a model for the greatest in heaven? Only in recent years have I figured it out. What do kids have, that we don’t? What did this little boy show, that we lose over time and must be transformed to recapture? Children raised by loving healthy parents, learn “Trust” from the cradle. At least, trust of their parents. They learn to trust that they are provided for… mom and dad will make sure they have something to eat. They learn to trust that they are safe and protected… mom and dad will make sure others don’t hurt them, that they don’t get lost or injured. They learn to trust that they are valued, treasured, affirmed… they will carry on the family legacy, delighting the heart of their father, bringing joy to their mother. As trust grows, obedience grows apace. When a child is secure that mom and dad seek only their good, their provision, safety, and security… parental directives are far more likely to be seen in that light. The child may wonder, or even ask, “Why?”. But the question is more likely to come even as the child is assenting and obeying, as opposed to the suspicious argument and immobility of the child who has learned NOT to trust. Jesus didn’t pose as His model just a “little boy”, but rather a “TRUSTING little boy”. Why do I say this? How do I know this? Because the text says Jesus “called a child to Himself and set him before them“. Let’s see… Jesus calls on a stranger boy in a crowd, as He talks Kingdom-of-God-stuff with His disciples… AND HE COMES! Think that through a minute. So… imagine yer a kid in the street. Maybe you’re alone. Maybe you’re passing by with mom and dad. Maybe you’re standing there with them listening to this (now) notorious or famous Preacher-Guy everyone’s talking about… and He looks your way with a simple, “Please come here a moment…” What do YOU do? Ever been called up onstage for a Magician… or a hypnotist? Ever been there when this happened to a friend? It’s SCARY! But this kid COMES! Why? Because the kid trusts Him and obeys Him. OR… perhaps it’s more accurate to say… this kid obeys Him BECAUSE he has been taught to trust adults in the first place. This boy obeys, yielding to Jesus’ invitation and will, TRUSTING that nothing bad will happen to Him because of that trust. Or, he may have trusted that his loved ones nearby would make sure nothing bad happened to him. Gentle Reader, I believe we’ve lost that capacity. I think the disciples, like ‘most all adults, had lost that capacity. We have to weigh the alternatives, look at it from both sides, consider the pros and cons, and come to a reasoned decision about what to do. Want to enter the Kingdom of Heaven? Want to attain greatness there? Gotta find another way to live. Gotta rediscover “trust”. Gotta get “reborn”, and then “grow up all over again”, reestablishing the sort of trust for God that we once knew as little one’s with our loving parents. When we do, we discover that God will ALWAYS provide for us, ALWAYS keep us safe, and ALWAYS cling to us as the delight of His heart and apple of His eye. When we honor that trust in one another, dealing uprightly, sacredly, honestly with one another… we fulfill the promise of His last words on this. Sometimes, our trust is abused and we are betrayed. Sometimes, even though we walk in trust honoring Him, we will be hurt by others. It is not our role to protect from that, or avenge it. Our part is to forgive. But Jesus is unmistakably clear that when we honor our Kingdom citizenship, living in trust and transparency, the King Himself, Our Father, will deal with those who abuse our trust. Good news? Bad news? Well, it is certainly unexpected news… do you aspire to greatness in the Kingdom? Then aspire to Trust and Reliance on the unknown will of God. Trust Him enough to obey. Treat others as equally sacred children. And as gradually our trust transforms us into yielding to Him (as we lose our self-protective fear), watch what happens! It’s that time of year again, isn’t it? Family dinners, company gatherings, holiday parties? Graduations, weddings? Cantatas and concerts? Everything seems to stack up to the end of the year, doesn’t it? For some, I suppose, invitations can be a chore or a burden. Too many, too busy, too tedious. But for most people, invitations reflect friendship, affection, joy. We invite those we treasure and care about, those we accept for who they are and whose company we value. On the other hand, what impact does it have to the heart, to relationships NOT to be invited or included? Imagine being overlooked for a staff celebration, dinner, or party? Not receiving an expected wedding or graduation invitation? Or even, being UN-invited, where after receiving an invitation to some event, you are later contacted and requested not to come? Wow, huh? Rather like being “un-friended” on FaceBook, wouldn’t it be? Where does that leave the heart, the spirit, the trust of a relationship? We all know this passage, this story. We’ve all heard it preached countless times. Nothing new for us here, right? Well, I kind of thought so… But as I prepared to bring an extremely SHORT message on this text, the Lord helped me see this in an utterly new way. Kind of a “21st Century” rushing-about way. How impressive, how “significant”, was this miracle? Did Jesus do what He was asked? As to the first question… no complicated theology about it… the text tells us that Jesus has come simply because “both Jesus and His disciples were invited to the wedding“. Nothing fancy or dramatic about it. It was the beginning of Jesus’ ministry, in Galillean territory, not far from Nazareth… Jesus wasn’t a “phenom” yet (this is his first public miracle). At this point, Jesus is just known as a “regular guy” (“Isn’t this Joseph, the carpenter’s son? Don’t we know his mother and his kinsmen?”) Jesus is just a “local”, hanging out with some fisher-folk… and some friends invite them to this wedding. Why is He there? Just because some friends love Him enough to invite Him… they want Him to come, enjoy, and share their joy as they marry. Second question… how important the miracle? Well, not to put too fine a point on it, but… really… in terms of that “Kingdom” – “Big Picture” – View we like to use when we play theologian…. um, not very much. I mean, think about it. He doesn’t heal here, or raise the dead, or feed thousands who come to hear Him speak, or take authority over and cast out demons! He doesn’t stop the sun in its path, or even forgive sin in God’s name. He, um… well… He makes wine. He makes wine from water. Not only that, but He’s not even relieving some random misfortune. The problem He solves, is their own FAULT! (I once had a sign on the wall of my office cubicle that read… “Poor planning on YOUR part, does not constitute an emergency on MY part!”) The groom, bride, parents, or steward failed in their task of planning, budgeting, or both. The party wasn’t over yet, and the wine ran out. So what? What was the worst that would happen? A couple fewer people would get drunk, and the celebrants would be a bit embarrassed before their community. So what? But apparently, Jesus just doesn’t think that way. For Him, this is more than a “so-what-no-big-deal” issue. Is this miracle “significant” or “important”? Apparently it was to Him. It was important enough to show His hand before His hour had yet come. Why then did He do it? Aside from the fact that it would please His mother (and there’s no getting around that one)… there was relationship involved. It would appear that He loved these friends, this bride and groom. He would not see them lose face or be embarrassed in their town. He didn’t even discuss the matter with them. The passage seems to indicate that they may never even been aware of the problem. Jesus deals entirely with servants and hirelings throughout. This miracle is a “rescue”, saving what would have been a social embarrassment and gaffe for these newlyweds, and transforming the celebration as not only success, but improving it. He diverted embarrassment and shame, leaving just joy in His wake. Jesus wasn’t “too busy” to care, “too holy” to be bothered, or “too righteous” to intervene simply to create joy for both the newlyweds and their guests. It seems as though He (and maybe His Father, too) hold “joy” as a fairly high priority. Wedding feast is probably winding down, as the wine is exhausted and (as the steward points out) the guests have “drunk their fill”. Due to somebody’s poor planning, or an unexpected bounty of toasting, the servers have run out of wine with which to refill the pitchers on the tables. They tell the headwaiter/steward at some point. He responds… not with a refusal to help, but questioning whether this is their business or not… and with concern about the timing. After all, they are guests, not family. This is the host’s business, not theirs. And… His time to enter the public arena had not yet arrived. Mary… says nothing… to Him. So, did Jesus do what was asked? No. He was never asked for anything but His attention. So… what exactly did He respond to? Did He just provide what was “needed’? I mean, the party was clearly winding down. There may have been a failure of planning, but these weren’t total nincompoops. The servers had to inform the steward when they ran out. The steward isn’t walking around wringing his hands saying, “O my! We’re going to run out of wine any second now!” He says clearly to the groom, the guests had “drunk their fill”. So, much wine had already been served. So what? So… only a modest amount of wine was “needed”. They just needed enough to “tide them over” to the end of the reception. Is that what Jesus did? Is that what Jesus provided? No… not hardly. Jesus did not provide what they “needed”. Nor what they “wanted”. Nor what “He was asked”. Jesus asked for the biggest vessels available, that they be filled to the “brim” (not just the “fill to here” line), totaling 120 – 180 GALLONS of the FINEST WINE! WHAT? What in the world were the couple going to do with all this? It was vastly more than their party could imbibe. Why would He do this? And eventually the story would “track back” to Him. The steward had offered the wine to the groom, who would then question the servers, who would ultimately point at Jesus. I realized as I pondered this, the couple probably wasn’t the richest in town… (After all, they’d underestimated their provisions for the feast, and they invited a carpenter’s son and fishermen as guests). How likely was it that their guests would finish off more than just ONE jug (20-30 gallons) of the wine? Not very likely. Which would leave the newlyweds with five (5) pure jugs (the cleanest vessels there were, for ritual purification), of divine vintage wine. What would the market value of such a gift be? Could that have been Jesus’ “wedding gift” to the couple, to help them get started as the local buzz about these folks’ “wedding wine” circulated through the area, and 100 – 120 gallons became available to share or buy? And why? Why did all this happen? Well, simply because He’s Him and this is the only way He CAN do things! He doesn’t do “object lessons”. He gave an undeserved gift, to enter into their JOY not their disgrace. It was pure, it was clean, it was divine! He made no big deal, just dealt with the servants. He didn’t seek any acclaim, in fact He hesitated only on that account. And all this was available, all this happened. just because He was INVITED! It was all a “relationship” thing. He was invited with His friends and family. His mom noticed a problem and gave Him a nudge. And the rest is history. For those of us who live in a universe of “Invitations”… of “Altar Calls”… of “Evangelism”… let’s keep this wonderful event ever in mind. “Inviting” people, because we love them, to take part in our lives, our joys and events, even our sorrows… (Jesus was invited to funerals as well). You never know what will happen when you invite someone. Invitation opens the door for relationship, for grace, sometimes even for miracle. My mind recalls a time, a place, a church, where the leadership requested that the revival speaker NOT issue an “Invitation”, an “Altar Call” that night. (Unheard of at a Revival!) Why? Because some people of color had entered the church, and if they came forward at the Invitation, the church would have to accept their membership… and that was NOT ok! That’s what it’s like to “refuse to invite”, to renege on an invitation (rescind it) or to “refuse to accept an invitation”. To close the door. To reject relationship. To reject the possibility and conduits of grace, love, and community. Invitations… such powerful things… whether we invite Jesus to be with us day to day. Or whether we respond to His invitation to be with Him, to accompany Him, to travel with Him, to party with Him. Invitations… making them and taking them… are the doorways to relationship… and relationship is the bedrock of miracle, love, and grace! Enjoy the holidays, Gentle Reader! Jesus had an earthly ministry for 3 ½ years; we read all about it in the Gospels. Do you recall His office address? Was He some kind of professional “bigwig”? Since Jesus is our model, maybe we should ask ourselves if there is a difference between His “ministry” and the modern concept we are all familiar with. Jesus told us more than once that He was here to do His Father’s will; we know that He had a great purpose which was to glorify his Father by accomplishing His Father’s purpose on the cross. Just looking at these few words, familiar to all of us, we can see that the ministry of Jesus was to serve His Father’s will and purpose; how did He do this? In all that He said and did, Jesus served His Father by serving people in a way that achieved the Father’s will: Jesus was God’s servant in addition to being God’s Son. Simply stated, a disciple is one who knows what the Master knows and who does what the Master does. Our Master is Jesus Christ, and we know what He taught His disciples from the Gospel accounts, and from the truths revealed to us in Scripture. What did Jesus do? He served God by serving others in a way that accomplished God’s purpose, which was to establish His Kingdom on the earth. What do we do? We serve God by serving others in a way that achieves God’s purpose which is the building up of His Kingdom by making disciples of Jesus Christ. This may take many forms as He leads us forward, but it always comes back to serving God by serving others, and what greater service is there to God than building His Kingdom by making disciples? What greater service is there to another human being than to lead them from darkness into light and building them up into the Kingdom of our Lord? In fact, this is the greatest act of love that there is, and it is what Biblical ministry is all about. True Love – What Does It Look Like? Love is a word that, I believe, has lost something along the way. I LOVE peanut butter and chocolate. I LOVE the beach. I LOVE the sun and I LOVE the rain. I LOVE that guy because he looks good in jeans or that girl, etc. and so on. You get the point. That’s not the kind of love I want. I want to be loved back. Peanut butter and chocolate do not love me back. As a Christian, I know what the bible says love is. God is love. I believe that. But what does that mean? To me, it means He is made of love, He is made to love and He is made to be loved. It’s not a light, on the surface kind of human love. It’s a love that goes so deep that I cannot see the bottom. It’s a sacrificial love. That is because I believe there is no bottom, no end to His love. I believe that the living God gave the ultimate sacrifice for me, His son, Jesus Christ. I believe the trinity of God, The Father, The Son and The Holy Spirit lives inside me. Therefore I should be full of love. But am I? There is the beauty of LOVE. God gave us all a free will. I can choose. I chose Him and all He has for me……… but I fail daily. Heck, hourly, by the second. I am a frail human being. I’m not condemned for my failure in this lack of love – although other humans like to condemn me – but God does not. He still loves me. I can on and on with what I believe, but the point I’m trying to make is – what does it look like to be loved? Now, why this post? I really want to love others. I want to look at the guy or gal who is full of hate and anger and totally thinks I’m out in left field — I want to look at them and love them. Love them no matter what. It is the hardest thing for me to do. To love someone who doesn’t love me back. Or even like me. But I have it within me to be able to do that. Baby steps. One step at a time. Pick myself up, minute by minute, and try again. To love. To love as I am loved. 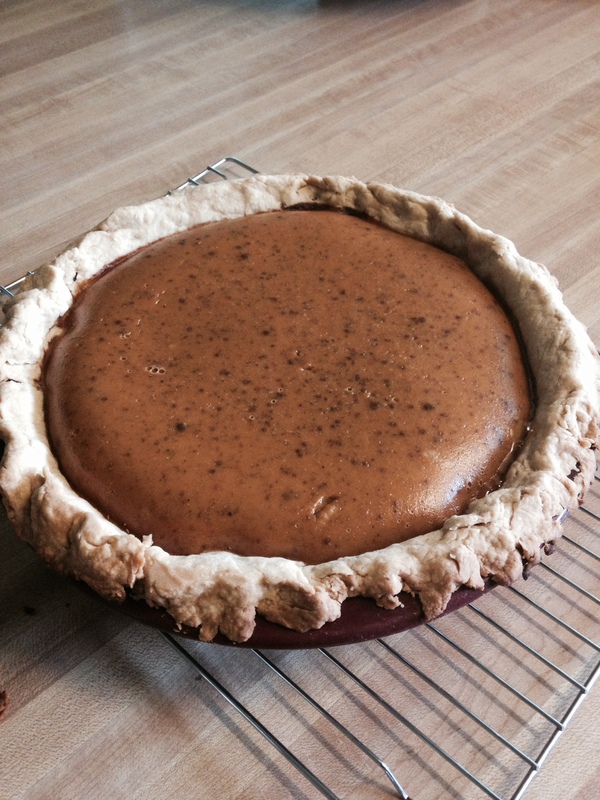 Here’s a fresh pumpkin pie out of the oven – made with honey and love. Have a piece with me and let’s talk about love.